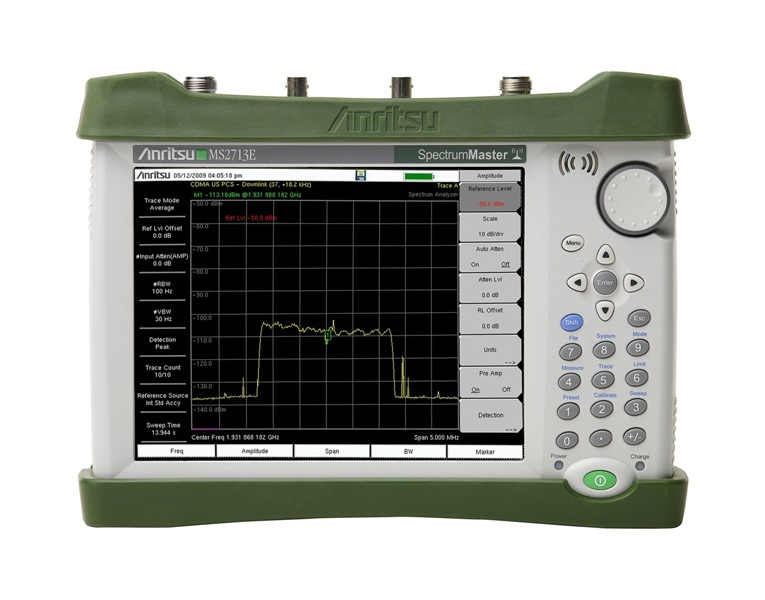 Anritsu Company has introduced enhanced MT8212E/MT8213E Cell Master™ and MS2712E/MS2713E Spectrum Master™ handheld analyzers that have new measurement capabilities and improved overall performance to address the rollout of 4G technologies, including TD-LTE. Offering superior performance in a compact design, the MT8212E/MT8213E and MS2712E/MS2713E offer service providers, network equipment manufacturers (NEMs), and third-party contractors and installers a cost-efficient and accurate test tool when deploying and maintaining LTE networks. The MT8212E/MT8213E Cell Master Base Station Analyzers now have 20 MHz demodulation bandwidth as standard, while it is offered as an option on the MS2712E/MS2713E Spectrum Master. The wider bandwidth makes the analyzers cost-effective alternatives for 20 MHz TD-LTE installations currently being deployed. Among the other enhancements to both models are improved Displayed Average Noise Level to -162 dBm (typical) in 1 Hz RBW and dynamic range extending to >102 dB in 1 Hz RBW. The MT8212E/MT8213E and MS2712E/MS2713E also have additional 1 Hz and 3 Hz RBW filters. Options are now also available for the MT8212E/MT8213E Cell Master that allow field engineers and technicians to conduct RF measurements, modulation measurements, and Over-the-Air (OTA) measurements on TD-LTE signals. The MT8212E/MT8213E handheld multi-function base station analyzers are the smallest, lightest, and most economical solution for base station testing during installation and commissioning, and for maintenance and troubleshooting. The analyzers combine the functionality and the capabilities of a cable and antenna analyzer, spectrum analyzer, interference analyzer, signal analyzer, backhaul analyzer, and a power meter into one instrument, making them the most full-featured compact base station analyzers on the market. The MS2712E/MS2713E handheld spectrum analyzers allow users to monitor, locate, identify, and analyze a broad range of cellular, 2G/3G/4G, land mobile radio, Wi-Fi, and broadcast signals. With a rich array of configuration options, the MS2712E/MS2713E eliminate the need to learn and carry multiple instruments when locating and identifying signals over wide frequency ranges. Both models have dedicated routines for simple one-button measurements for field strength, channel power, occupied bandwidth, Adjacent Channel Power Ratio (ACPR), Carrier-to-Interference (C/I) ratio, and AM/FM/SSB demodulator.